As 1990 rolled around myself and Darren weren’t left completely on our own in running a karate club, I had just turn 16 and Darren 18, thankfully we had a bit of help from another instructor of a club local to us. Jeff ran the club at Bingham at that time, he would come and train with Alan and when I was able I would go over to his club at Bingham on a Friday evening to train. Alan had asked Jeff to be our advisor and just to help us through, so Jeff would train under us on a Tuesday evening and then teach for us on a Thursday evening, which gave Darren and myself chance to train, I would continue to train at his club on Fridays as and when possible. I think there are four main types of good karate instructor, yet there are many bad ones. There is the instructor who has great technique, but lacks the knowledge or personality to convey his message across, he can’t really explain it, you just watch and try to replicate, maybe great for bringing through lower grades, but not always good to give higher grades the knowledge they needed, at this point in my life I think this was about where I was, maybe lacking a little bit in technique though. Then there is the instructor who is maybe struggling with injuries or older in their years, they lack the technical ability to show the technique the way they want, but can explain the technique is such simple terms that a good student can still learn from. Jeff was like this, he was in his 60’s, both his hips were gone and would in the coming years be replaced, but his knowledge was great, he could spot minor flaws in technique and correct them, I learnt a lot from Jeff, he was a quiet man, but you simply respected him, I owe a lot to Jeff in those early years, I think he taught me how to be an instructor. There is also the all rounder, this is where Alan fell, he had good technique, very good technique, he had great knowledge which he could convey easily, he could also get that last inch of effort out of you when you really thought you had none left, he was a great instructor, not the greatest technique or knowledge, but still had covered all the bases and could inspire that last drop of energy. Then there is the instructor who has everything, amazing technique, unequalled knowledge and can get his point across easily and also has that personality that inspires, these guys are few and far between, if you find one, train under them as much as you can and learn everything you can, you’ll love every minute of it. At that point in my life, I guess I had good technique, I had good knowledge, I just had to get over my shy personality and find a way to put what I knew in to words others could understand without me freezing or looking unsure of myself. One thing I decided I had to do was get my technique to level I wanted others to do it. I believed that in order for me show the technique and explain it the way I wanted them to do it, then I had to be doing it that way too. I couldn’t correct them on something that they had copied me doing, if I wanted them doing the technique the right way, as far as I was concerned I had to be showing them the right way too. Explaining wasn’t enough, it was all or nothing. So in a way I became my own teacher, I had to analyse everything I was doing and make sure if I was explaining what I wanted, I was doing it also. It brought my technique on leaps and bounds, I learnt to trust my body to perform the movement the way I wanted it to, if it was wrong it would feel wrong. Don’t get me wrong, I still needed someone like Jeff to run an eye over me from time to time, along with other visiting instructors, I had to keep improving and keep analysing, it was a never ending circle and really, it always should be, we shouldn’t get complacent, shouldn’t think we know everything, nobodies perfect, if I became perfect would there be a reason to carry on training? In time I would ask my students if they thought they were really knew their Kata for their next grading and could do it well. I know this might sound harsh, but follow me on this one, but they would always answer yes to both questions, so I would respond that they were better than me! This got a look of consternation from them all, confused, perplexed, how could they be better than me, they looked up to me, parents would say their kids wanted to be as good as me and in truth every instructor should aim for their students to be better than they are, that’s the goal. But I would explain, that I know the directions of the kata, I know the pattern, but I’m still learning it even now, I may win kata competitions, but I’m not the best in the world, I’m not world champion, I still do not know any of the katas I can do properly, so they should always look to improve, I can do them well, but I still need to study them and do them better, there’s always room for improvement, lots of room for improvement. Sometimes we have to humble and realise we need to improve, maybe we are trying to help others improve and we are further along the journey in what ever part of life, be it karate or just life in general, then we still need to improve. I would look at students mistakes and then look back at myself, if I was doing that the. I needed to correct myself and improve, with kids especially it’s a case of monkey see monkey do, even adults would do that to a certain extent, so as an instructor I strove to learn from my students too, you’re never to good to improve or be taught a lesson by your students either. I found the adults interesting, when older adults came along as new beginners they struggled, we would get very intelligent guys and women come along, teachers, businessmen, all sorts, but they struggled and got so frustrated. I came to the conclusion that they had forgotten how to learn! I suppose as a kid or young adult, you spend all your time in a learning environment, learning all the time and especially as kids with sports and maybe even young adults in new manual jobs where you are actually training your body as well as your mind, you will find it easier to learn karate. If you haven’t been in a learning environment or done any training where body coordination comes into play you will struggle. Don’t get me wrong that doesn’t stop anybody training, with the right mentality that can and will be over come, but the frustration of some of these guys was plain to see. We had adults who just could grasp which was their left or right leg, they knew left and right, but getting the to move the right one, as well as say punch or block at the same time was hard work. They just hadn’t been in that kind of learning environment for such a long time and they began to show their frustration, they wanted to train hard and strong, they believed that’s what an adult like them should be doing, but in reality it was the opposite, I tried to get them to slow down, pay attention to their body, to feel their way through and concentrate on the basics, the speed and strength could come later, but no they were like bulls in a china shop, they had to go hard and strong. Eventually I would get through to some, others we lost in frustration, some just wanted to fight and didn’t understand you have to do the basics first, over and over again, and keep doing it until they were of a reasonable quality and control to allow them to fight. I think people expect to come in and fight straight away, kids want to be ninja turtles or power rangers straight away, like on the TV and films, adults wanted to be like the higher grades straight away, they don’t understand the process to get to the level where they are, it’s a journey, not a quick fix, just like life. Sometimes we all have to slow down and go back to the basics. Sometimes we all have to look at our life technique and reevaluate it, never be afraid to learn from someone at a different stage of the journey, whether that be ahead or behind us, there are lessons to be learnt from everyone. This entry was posted in Karate and tagged Become Who You Are, Improvement, Instructing, Instruction, Instructor, Karate, Kata, Learning, Mainstay, Teaching, Technique on January 18, 2016 by waynemali. So just over a year ago I posted this: Retired!!! 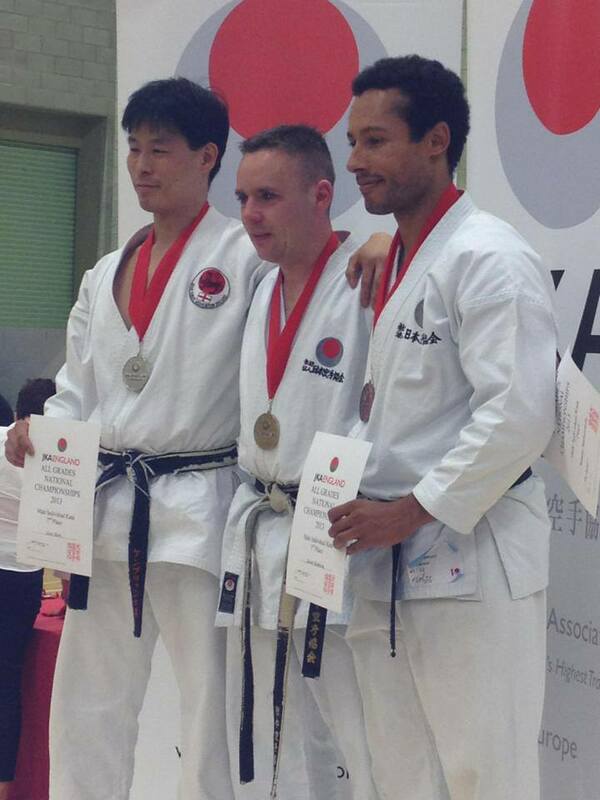 The previous year I had retired from competing at karate after thirty years of competing and bowed out as my associations 2013 Mens National Kata Champion, the second time I had won the title. So last year the deadline for entering came and went and I decided that I was staying well and truly retired. When I went to last years championships, I guess there was a longing inside to compete again, watching the competition that day, I knew I could still beat the majority of them, even though hadn’t done much karate over the previous nine months, due in main to the depression I found myself in and the subsequent decision to scale down my teaching involvement for a while. I never meant that scaling down to be permanent, but in fairness I haven’t really got going again, I teach at least once a week, no way near the five sessions a week I was teaching two years ago. I’ve found it hard to get the motivation back for it. It’s been my life for so long and in a way my weeks and to a certain extent my life was organised around it, due to my commitment in running the club. Luckily for me over these last eighteen months, I have a very able assistant instructor who has taken on the mantel of running the club and allowing me the freedom to come and go when I please. It’s been nice to not have just be there all the time, it’s been nice to pick and choose when I go. In a way I’ve become quiet lazy about it though, there are nights when I could have gone, wanted to go, but just didn’t, the motivation wasn’t really there. So three weeks ago, with the forms for this year’s National’s entries in my inbox, I made a choice that I was coming out of retirement. Despite the fact I’ve done one training session myself this year and my involvement in teaching has been at best minimal, I had no preparation, I was back to being overweight and needed to get myself in shape again and get back some motivation. So three weeks ago I started the early morning walks, the weight started to come off once again, I booked this past weekend off work and made my travel preparations. I told only my assistant Steve, my boss and a colleague at work and our Campus Pastor at our Church Campus in London Bridge, other than the organisers of the National’s, no one else knew, not even my family. The only other preparation I had apart from the walking was a quick fifteen minute run through of the Kata’s I would need and that was that. I decided to tell as few people as possible, so I wasn’t putting added pressure on myself, I just wanted to be able to turn up and give it ago, no fanfare, nothing, just to go and take part, what will be will be, no added pressure! So Friday morning I set off to London, met with Melvyn, our Campus Pastor in London, for a coffee in London Bridge, then carried on to Crawley, spending the night in a Travelodge in Crawley town centre. All in all it didn’t go that bad, I got through the three elimination rounds without losing a flag, two competitors compete side by side and the five judges raise a flag to either red or white, depending on who they thought performed best, so things were going well and I wasn’t feeling that bad. Come the semi final, I wasn’t doing that bad, until an old injury flared up and made me stumble slightly, but not enough to drop too many points and I still made it to the final the second highest of the four finalists. Once again in the final I felt okay, until near the end and the injury flared up once again, making me stumble and rush through the final sequence, I wasn’t happy with that part, but in the end I settled for third place. All in all, considering everything finishing third, with little prepation, still overweight and carrying an old injury, I’ll take that. Plus when I look and see that the two that beat me are both close to twenty years my junior, it’s not all that bad! So now what, well there’s another competition later in the year, this time organisations from Scotland, Ireland, Italy and Norway will be sending competitors, so I plan to take part in that too, there is plenty of time to lose a little bit more weight, to get back down to the weight and fitness I was when I retired, so let’s go for it. I stayed over in Crawley again on Saturday night and left for London first thing, I went to our Church in London Bridge, they only joined with our Church at the beginning of the year, so I don’t really know anyone there, but they all made me feel welcome. My presence there surprised Gareth, our lead Pastor and if you know my testimony, Gareth is who I called that morning back in March 2012 when life had become too much, he answered my call and came around that evening, he brought God into my life and began the process of my recovery, I owe him so much. I did receive a bronze medal for finishing third, but I felt inclined to give it away, so I gave it to Gareth’s young son Reuben as a present. It just felt like the right thing to do, my last medal, the Gold medal from two year’s ago resides now in Swansea, with my old Connect Group leaders Paul and Sarah, I gave it to them as a gift and a thank you for all their support, when they left Newark to start a new Church in Swansea last year. I must say I didn’t feel 41 when I was competing on Saturday, I didn’t feel that bad this morning, but as the day wore on at work, I am feeling it now, hopefully it will wear off in a day or two and I can carry on with getting fit again. I came across this song on Thursday night and I’ve been playing it on repeat almost all weekend, I had it one whilst I was travelling over the weekend and even as I sat relaxing between rounds on Saturday, it brought a very calming influence over me and it’s a great song too, it’s long, but well worth a listen. This entry was posted in Faith, Karate and tagged Christ, Competing, Faith, Freedom, God, Grace, Hope, Inspiration, Jesus, Jonathan David & Melissa Hesler, Karate, Kata, Recovery, Redemption Rain, Retirement on June 29, 2015 by waynemali. Just like twelve months before, May was a month of picking myself up and getting myself back in shape. The year before I was just coming out of the pain of withdrawals, back then as soon as I felt I was free from that pain, I started exercising and began a program of losing weight, in order to be fit to compete at the National Championships. After the stop start months of March and April, May was a month to get back to where I wanted to be, especially with the Nationals fast approaching on the 29th June 2013. This year it was to be my swan song, I had planned a few years previously that I was to retire from competition after this years competition. I had participated in my first National Championships at the age of nine, back in 1983, this year would be my 30th time competing at the Nationals, so as I was now 39 and fast approaching 40, I thought it was perfect time to step down from competing and bring a close to what had been a fairly successful run over the years. Three years previously I had actually won this competition, at that time I was well in the throws of my addiction, I was overweight, I even drank the night before, but I still had it together at that point to put in a good performance and win. The following year I finished second, but by that time I had put on even more weight, I was totally unfit and as the year before had been drinking the night before. Somehow I still managed to perform to a good standard, despite all that was going on in my life, I may have been a mess, but as I’ve stated before, once I put on the karate suit I seemed to leave that side of my life behind, somehow I managed to outperform who I was. Obviously the year before I had tasted disappointment, I had so much expectation that I could get back to winning ways, I was fitter than I had been since I was a teenager and above all sober, but things didn’t turn out the way I had planned them in my mind, but in all honesty that was the best way, I think it was right that I didn’t win that year, I wasn’t ready for that step, I was to wait and wait I did. Come the day of the competition we drove down on the morning of the competition, it was a long drive, well over three hours, we set off very early in the morning, ready for the 10am start of the competition. Yet somehow I still felt calm and relaxed, ready to go. Back in 2006 I went into the competition as probably the favourite, I had finished second the year before, I had competed earlier in the year at the European Championships and also been selected for the World Championships in Sydney later that year. I made it through the early rounds with very few problems and went into the semi finals pretty confident. But a combination of my health problems and the volume of alcohol I had consumed the evening before, conspired against me. I had spent the evening before at a barbeque, watching the England vrs Portugal World Cup match, the infamous match in which Rooney was sent off and Ronaldo’s wink! I hadn’t intended to drink as much as I had, normally the night before a competition I would limit myself to one or two. I must add that at this point in time I don’t consider that I had an alcohol problem, I drank and drank regularly, but I drank socially, not to escape my life, at that time life was pretty good. My blood pressure issues and circulation lead me to have clammy hands and feet, this became worse when I drank. So at the competition in 2006 they were using a new set of mats for the semi finals, unfortunately these were proving to be a little slippy in general, most people were managing to handle them, but not me, I managed five moves into the kata Enpi and then slipped and fell. At that point it was all over for me that year, I had fell in front of everyone present and had to carry that with me ever since. Since then I had stopped using katas that were flamboyant or fast paced, settling for competing with katas that were safer for me to perform, yet more conservative. So this year I decided that if I was going to go out one last time, I was going to do it with my favourite katas and not the safe option. I was going to defeat those demons that had haunted me since that day in 2006. Things went well through the early rounds and without any problems I made it into the semi finals. In semi final I performed the kata Enpi, this kata I hadn’t performed in competition since 2006 and this time everything went fine, I qualified for the final as the highest scorer. Just as the last competition, I had found a way to keep calm and relaxed before competing, part of that was praying and just breathing, it seemed to be working for me at least. In the final I decided to use a kata I had not used since the 2007 final, on that occasion I had trouble with the fast turns in the kata, because I couldn’t get the grip with my clammy feet, so I had stopped using it too. So for the final I sent with Sochin and performed well enough to win my second and last National Championships. The response from my fellow competitors and old squad mates was amazing, they seemed to really appreciate what it meant to me. At the medals ceremony my retirement was announced and I was given an unprecedented introduction as I collected my medal, usually thing occasions are quite formal, but not this time. As I collected my medal and stood on the top of the podium to the great ovation from all the competitions, spectators and officials, the emotion began to get the better of me and I admit there were a few tears. The whole day couldn’t have gone any better, it was just the way I had hoped it would be, in a way it was the way I wanted the previous year to be too, but now I really appreciated that it was worth the wait. A couple of weeks later the Chief Instructor of our association and my former squad coach came to my club to conduct a grading. We spoke about the competition and he told me that I shouldn’t retire yet, he believed that I had competed better than he had ever seen me compete and there was still more to come. That confused my decision to retire, but in the end I stuck to my guns and decided that I had finished with competing. I’ve come to find the hand of the miracle man. I’m standing at the feet of the miracle maker. I’m staring in the face of the miracle maker. I’m walking in the shoes of my miracle maker. I’m standing with the faith of a miracle maker. This entry was posted in Faith, Karate, Sobriety, The Story So Far and tagged Alcoholic, Alcoholism, Awakening, Christ, Faith, Freedom, Friends, God, Hope, Inspiration, Jesus, Karate, Kata, National Champion, Prayer, Recovery, Sober, Sobriety on April 15, 2015 by waynemali. And it’s true, in victory so a number of bad memories were eradicated, not just in the overall victory of winning the championship, but in the journey on the way to victory. Back in 2006, I was on the England Squad, just competed in the European Championships in Germany and been selected to compete in JKA World Championships in Sydney, Australia, so when it came around to that years National Championships, I was naturally one of the favourites for the Men’s Kata title, I had been runner up the previous year and expected to be up there again, if not win it. I made it through the eliminations quite comfortably and lined up for the semi final with eight other competitors. I watch the first handful of competitors take to the mat complete their kata and receive their scores, quite comfortable with the fact I could qualify for the final quite easily, then it was my turn, my name was called, I walked to the edge of the mat, bowed and walked forward, I announced my kata and started in my own time, the first seven moves seemed to be flowing well, speed, power was there, stances were strong and I was focused, then move eight, to lift the right knee high, drive forward with the right leg, taking a long step, then quickly pull the left foot tight behind the right whilst punching with the left hand, moves that are fast, strong, but fairly straight forward, but as I moved the world slowed down, the surrounding noise of the hundreds of people in the sports hall became a hollow echo, this wasn’t right, this had never happened before. Quite literally I was moving in a sense of slow motion, I don’t remember how it happened at the time, the next thing I remember was that the echoes became silence, the sort of noise where you can hear a pin drop, I was lying on the floor, flat out, sprawled out on the mat, I remember turning myself onto my hands and knees and pounding the floor in anger with my right fist, I still wasn’t sure where I was actually or how I had got there, but it was over, in that moment the dream was over. I came to my senses and slowly rose to my feet, I turned to face the Chief Judge, put my feet together, bowed and left the mat, I wouldn’t receive a score, my day was over. I kept my dignity and my anger inside whilst my fellow competitors completed their kata’s and the line up for the final later that night was completed, it wouldn’t include me that year. We all lined up along the edge of the area, bowed out and I left the hall quickly, I didn’t want to speak with anyone, see anyone, I was angry, immensely angry. I snapped at few people who hadn’t seen what had happened, who had simply asked how I’d got on, once I had calmed down later, I apologized to each one of them, over four hundred people had been in the hall, the majority of them had their eyes on our area, watching my fall from dignity, shocked, silenced. Some time later that day a friend was brave enough to show me a video of what had happened, as I planted my right foot, I couldn’t get any grip on the mat, already slipping, my left foot came up behind it very quickly and effectively took out my right foot, putting me flat on the mat. I blamed the mats, I blamed everything, but myself, I looked for every excuse under the sun, other than myself. I knew I had an issue with the soles of my feet and palms of my hands excessively sweating, especially when nervous or under pressure, this I had suffered with since I was young, only it was getting worse as the years went by and I got older, I attributed it to my chronic high blood pressure issues, it certainly had seemed to get worse as my blood pressure problems increased over the years. I never used that kata in competition again, I loved it, but was scared to use it ever again, I chose to use a more safe solid kata, less dynamic and definitely not as expressive, but Jion had a lot less risk of slipping than Enpi, so I started to use that one instead and each time I’ve used it since, I’ve made the final comfortably, but I never dared go back to Enpi, I was too frightened to undergo that embarrassment again. 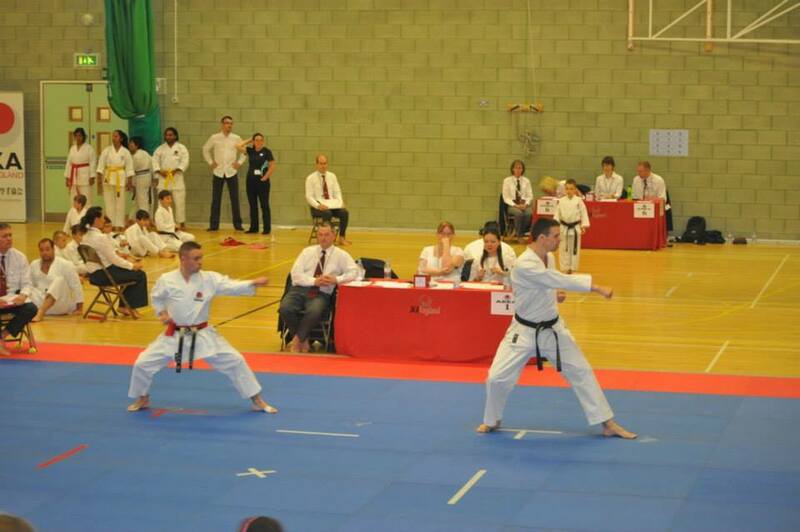 The next year I made the final with Jion, so in the final I chose my favourite kata Sochin, but this year the mats were incredibly slippery, everyone was struggling with them, therefore I was going to struggle even more. Sochin, I loved, it has lots of extremely dynamic turns, but performed on the ice ring I would find myself on, it was barely controllable, I did complete it, but it wasn’t great, I wasn’t happy, but it was good enough for second, I hadn’t suffered as badly as two others, but more than Darren who held it together better than the rest of us to win, after that I never used Sochin again, my nightmares were slipping on that mat, I had been on the edge again and I wasn’t comfortable, I went with the safer option after that, not my favourite or my best option, but the safe one. After that year I invested in chalk for my feet, it definitely helps, I get enough grip to be comfortable, but there was still an element of the excessive sweating that it could not fully mask and the odd minor slip was common place, but I could control them. But the long and the short of all this, is that I had all the ability, yes I did have issues with excessive sweating, but although it may be attributed to the blood pressure problems, that wasn’t the problem that was making it worse. The drinking was making the problem an issue for me, it was the drinking that was holding me back from my potential. The night before the competition back in 2006, I wasn’t tucked up in bed early, mentally preparing for the challenge the next day, no I was watching the World Cup, watching England lose to Portugal, drinking as many cans of strong lager that I could consume, no thought for the competition, just drinking and having a laugh, well we didn’t actually laugh when England lost that’s for sure! I took to that mat with what I now understand was my permanent hangover, only since I’ve stopped drinking do I realise that the constant feeling of being a little bunged up with phlegm and a little lethargic, together with the constant sweating feet and hands, these things aren’t the normal, they were my own creation. The main judge that day was our Chief Instructor, Ohta Sensei, the man that had showed faith in my ability, chosen me personally for the Squad and the World Championship team, I had to try to avoid his gaze that day when I bowed and walked off the mat, now I truly understand I how much I let him down, he may never know the true reason why I fell that day, I know and I’ve lived with it eating me away over the last few years, this past fifteen months in particular. A few weeks ago when I started preparation for the competition, I started to contemplate using Enpi and Sochin again this year, I knew I was going to retire and I wanted to going out doing what I do best. My hands and feet still sweat, but no way near as bad as they used to, so with the use of my chalk, surely I could get it right this year, but was it worth the risk, I couldn’t decide, it was my last chance, if I slipped again, I did last year, only minor, but it was enough, this year I couldn’t take even the slightest risk, I would have to play it safe. So after an early start, a 180 mile journey to the venue that morning and a couple of hours of waiting around, we lined up for the eliminations, I chalked my feet and took to the mat. I breezed through my eliminations and the grip on the mats with the use of the chalk was just right, I was happy and comfortable, I was through to the last eight, I was closer to the end. As we milled around awaiting the start of the semis one of my fellow competitors asked which kata I was going to perform, quite frankly at that point I was still undecided, safe Jion and make it through, or risk Enpi? I was the fourth person up of the eight, the highest mark score of 24.4 had been posted by last years Champion, who I was to follow, as my name was called I was still undecided and that’s not like me, I’m usually fully aware of which kata I’m doing so I comfortable and focused, a safe Jion would see me through, maybe not beat Ken’s score, but I knew I would be pretty safe, but as I bowed my mind was set, this was the day, not just to retire, not just to go out Champion, but to erase the DEMONS, to ease the pain of those memories, this was the day to do Enpi, to just go for it, it was the last chance to prove something to myself. So in an almost repeat of 2006, I bowed walked on and announce my kata Enpi, although Ohta Sensei wasn’t main judge, he was one of the corner judges, his score would count too! The first seven moves went well, then on to that move number eight which had haunted me for seven years, well the seven years of bad luck that went with it were over, I landed it and I could feel the sense of relief as I move on to the next move, repeating that same move a further two times, then landing the jump at the end comfortably to complete the kata. My score was 24.5, I was in the lead, I watched the other four complete their kata’s, but none could match my score, I was through, I had the highest score, but more importantly for me that relief was immense. The waiting around for another seven hours before the final was hard, but I was ready for the final, my mind was fully set on Sochin, I was going out giving it my best shot, as I was top scorer in the semis I would go last, the reigning champion would go immediately before me, true to form he set the highest score of 40.5, that was what I had to beat. As I stood at the side of the mat awaiting my name to be called, I followed the same preparation had I taken before each performance of the day, I prayed, I prayed for strength, but mainly for the calmness of heart to give it my best and then I walked to the mat, bowed, walked on and announced Sochin and started. At that point, it was just me, although Ohta Sensei was sat right in front of me, the world had faded from my eyes and I was completely in my zone. Once again, there were no slips, I completed the kata and awaited my score, I could see some of the scores cards go up, but only three of the seven, if the rest were like them I was fine, as the scores were announced, I had the feeling that it was enough, the total score was called out and 40.7 was enough, I had done it and it was over, at that moment face to face with Sensei, I had to really fight to hold in my emotion, I bowed left the mat and returned to my fellow competitors, still holding in the emotion and relief. As the result was officially announce, the tears were forming, but when I walked away, I couldn’t hold them in anymore, I let go. The congratulations of my fellow competitors, former team mates and friends alike, was immense, it was all just overwhelming, I’m not sure what was really the main reason for the tears, the emotions where many. The emotion really was four fold, firstly the elation of winning, the sheer joy of reclaiming the title of National Champion, I had held it before, but back then I was just starting that very steep decline into the abyss, from just a drinker to alcoholic with no control. Then the sense of the impending retirement, this was the last time I would ever do this, ever go through with competing, stand alongside such good friends and fellow competitors, emotions of elation mingled with emotions of sadness. Then the relief of eradicating the memories of the previous failures had been put to bed, I took a chance, I believed and went for it, I prayed and defeated those bad memories. Then finally the big one, after everything, after the last couple of years, after facing myself in the mirror with pen knife to my wrist, after wanting to find a way out of life, after all the madness and the self hatred, after all that, after finding a way out, after finding God, after accepting Jesus, after the most amazing journey that I have trod since the end of March last year, I had overcome all of that, I had overcome and conquered and achieved what fifteen months ago I thought was impossible. All those the emotions were hard to keep in, then as I waited for the medal’s ceremony, the results of event after event were announce and it dragged on, but they did that pretty much intentionally, when my category was announced, after the bronze and silver medal winners had received their medals, Tony Cronk, the JKA England Chairman, made a special announcement, with a wonderful speech announcing my retirement after 30 years of competing, he asked the crowd to raise their voices in appreciation and I walked up to collect my medal with the loudest cheer I’ve heard at one these events, needless to say I couldn’t hide the tears then and even as I type this now the memory of that moment has brought me to the edge of emotion again and the tears are slowly rolling down my cheeks again, it’s a memory I will never forget, the appreciate of all those people, fellow competitors, instructors, judges, parents and children, was just amazing, a day and a moment that will live with me forever, thank you Tony for inspiring that moment, I will treasure it always. The emotion of the day was immense, I’ve shed many a tear over the last fifteen months, mainly tears of pain, of hurt and mourning, there have been the odd moment of tears of joy, my Baptism being the greatest of all, but this day will live on with me always. This was the day where I can finally let go some of those regrets, I can put behind those failures and move forward, the day I finally knew that truly a New Creation stands and what has gone before is forgotten, where my dream was achieved, where I believed and prayed, where it all came together, what a day. I know there are videos of my semi final and final performance, which when I have received them, I will post, I promise. This entry was posted in Faith, Karate, Sobriety and tagged Alcoholic, Alcoholism, Awakening, Christ, Faith, Friends, God, Gold Medal, Inspiration, Jesus, Karate, Kata, Kim Walker-Smith, Miracle Maker, National Champion, Pray, Prayer, Rebuilding, Sober, Sobriety on June 30, 2013 by waynemali. Regular followers of my blog know I’ve been doing karate now for almost 33 years, I started when I was a mere 6 years old, which for back then in 1980 was very young, but now is actually old, as many clubs these days accept 4 and 5 years olds, in fact I teach 4, 5 and 6 years olds on a Friday evening for the Sports Centre, hard work, but fun! I started competing in local competitions back in 1982, I wasn’t even a brown belt then, a lowly purple belt, but I was young and still naturally very shy, but keen, plus we had a big junior class then and there would be many of us competing in the same category, so we would encourage and support each other. In 1983 I competed at my first National Championships, just a brown belt and 9 years old, I actually wasn’t old enough to fight, you were supposed to be 10, but my instructor put me in anyway, I remember beating a black belt in the first round, but then losing in the second to another black belt, but that didn’t matter, I had beaten a black belt, that was good enough for me, the black eye and bruises were a bonus. But this month that will all come to an end, at the end of June I will enter my 30th National Championships, then that will be it, my swansong, my final foray into finding the zone and walking out onto that mat, then giving it my all, after over 30 years my competition career will come to an end, win or lose, I will bow out. Over the 30 years, I’ve had the chance to compete on the highest level, taking part in the World Championships in Sydney, Australia in 2006, as well as four European Championships, I never won a medal at any of those, but the experiences were priceless. At regional level I’ve had success, with many local wins and four regional titles in the Mens senior kata, including nine consecutive finals. At National level I had success firstly as a 13 year old back in 1987, winning a bronze medal in the free fighting, back then our category would have well over 100 other 12 to 15 years olds, so a bronze medal then was a big achievement. 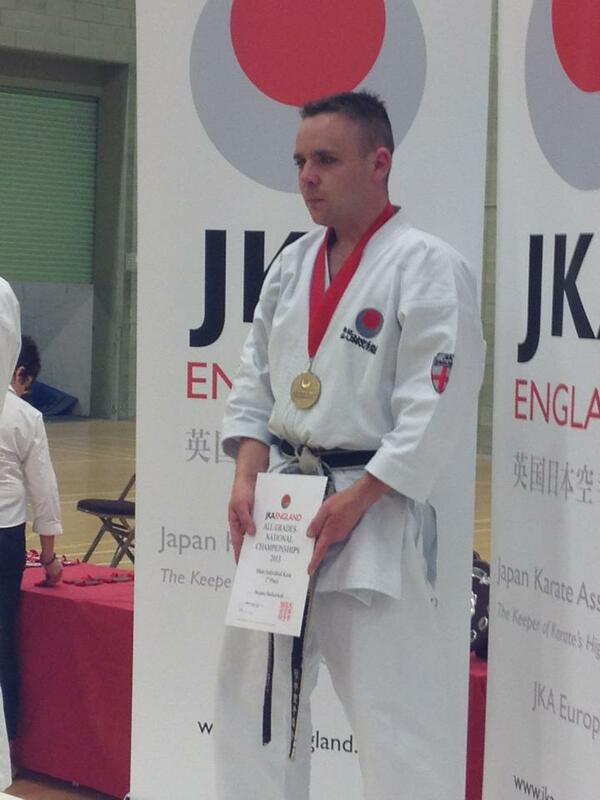 Since then as an adult I’ve majored in kata, more performance than fighting, in the last 10 years I’ve reached five national finals, winning four silver medals and three years ago finally winning the Gold. But each time I compete the nerves are still there, even after 30 years of competing, those nerves never go away, you just find a way to deal with them, to find your way into your ZONE. Many people have different ways of preparing, in the eliminations I do banter with my other competitors, but I also like my own space to find my composure, but when my name is called and I walk to the edge of the mat, everything changes, then once I bow to walk onto the mat, everything else fades from view, apart from the main judge and his instructions, everything else is blanked out, it just me out there, even my opponent who is performing next to me is blanked out, only I can beat me now, I can do nothing about the other guy, if he’s better than me, then so be it, if he’s not, then so be it, it doesn’t matter either way, I have to perform at my best win or lose, if I don’t then I’ve let myself beat me, if I give it my all and outperform myself, but still lose, then that’s okay, I given my all, the best I can do and if my opponent is still better, then I have to go away and work harder. When I make a final, I’m even more withdrawn, I pace around, find my space, visualise my performance, then when I’m called I blank everything out, at these times, the eyes of hundreds of people are on you and you alone, it’s your time to shine or your time to shrink, if you let the occasion and the crowd get to you, you will shrink. I find a zone, my zone and again there is only me and the chief judge in that zone, everyone else isn’t there, only I can beat myself again, only I can make me the best I can be or the worst, so I blank the world out, focus my eyes and my mind and give everything I have. Some people are relaxed in their preparation, some freeze and struggle, I find a happy medium of fighting my nerves, which are always there, they never die, they still affect me even now, but I pace, I walk, I stretch, I keep moving, until I have found that zone, then when I take to the mat, I move deeper into that zone, that works for me. But soon, I will face that for the last time, the end of an era, whether I flop in the first round or go all the way and win, I will retire, I will concentrate on developing the next group of champions and England Team members that maybe developing in my club. But hey, when this time rolls around next year, will I get the itch again, will I catch the bug again and take to the mat, just that one more time to see if I’ve still got it or will I just let the next generation fight it out amongst themselves, watching from a nice comfy seat in the crowd, just watching them find their zone, rather than trying to rediscover mine, who knows? This entry was posted in Daily Prompt, Karate and tagged Competing, Competition, Inspiration, Karate, Kata, Losing, National Championships, Winning on June 2, 2013 by waynemali. Just got back home after a very long day at a karate competition near London, so tired now, but it’s been a great day. After the roller coaster week I’ve had, I have to say I’ve been in two minds about going, but not only had I entered myself, I had also entered two of my students, one young lad was taking part in his first competition, so I was really obliged to go, although deep down I really didn’t want to miss my Sunday morning in Church, it means that much to me now. But I’m glad I did, my young student did well for his first competition, although he lost in the first round of the kata (the performance of pre set routines), he beat the same opponent in the kumite (free fighting) before losing in the next round, a great start to his competition career, I was a proud instructor. My other senior student, who entered, finished joint third in the kumite, narrowly losing his semi final to the eventual winner, another great performance. Now to the bit I know you are all waiting for, how did I do? Well I got through my first few rounds of kata this time, no first round exit, made it to the semi finals, then comfortably made the final later by winning my section. At this point whilst waiting for the final I had to get out, get some fresh air, well sort of, I really just wanted to cry, I was overwhelmed with emotion, I needed to shed some tears and in a hall with 300 plus karate competitors was not the place. Why the emotion? It wasn’t over yet, there was still the final, but at that point I was so happy to be doing well, to be competitive again, I just wanted to cry, the final was just a bonus, actually taking part was the victory. Having said that I am very self-critical and I wasn’t overly happy with my kata in the final, it wasn’t my best, but it was good enough for second and a silver medal, behind the current National Champion, so after all that I was a little disappointed not to win, having come so close, but so happy to have taken part, still been competitive and in light of the past year done so well. It was also great to catch up with old friends, some I haven’t seen for some months, the first thing that hit many of them was my new slimline figure, the little fat man was gone, I must admit I enjoyed soaking up all the great comments about my new look, I think I deserve to feel good about myself today, I’ve worked hard for it. Some of my friends knew a little bit about my struggle, many of them didn’t know a thing, I spoke with a few people about it, I guess I was drawn to speak with these friends and each one had similar stories from their past, they gave me so much encouragement, I feel blessed just to know them. Once again this week, despite all my self doubts, everything turns out pretty good, it’s been a fantastic day, if only for meeting old friends. Just to compete again was a great feeling, to get a silver, well it actually feels great. I feel good about myself today, the last ten days have lifted me so much, but I’m sorry I feel a little selfish here, a little self-centred, but I’ve loved all the fantastic compliments, I think for once I deserve to feel this good, because these comments do not just praise how far I’ve come, but they praise the glorious work our God has done within me. This entry was posted in Karate and tagged Alive., Faith, Friends, Inspiration, Karate, Kata, POD, Rebuilding, Recovery, Silver Medal on November 5, 2012 by waynemali.